I SCRAMBLED down the steep grass slope, falling on my bottom a few times and nearly turning an ankle, but always keeping an eye out on the slope above me. A loud roar was rising in the distance and then I saw it, a nearly naked man decorated in chicken feathers and body paint descending at high speed on a sled made of banana tree trunks. I only had a few attempts to capture the shot I had in mind of this athlete, a native of Easter Island participating in the extreme sport of ‘haka pei’, a competition held during the island’s annual Tapati Festival in February. 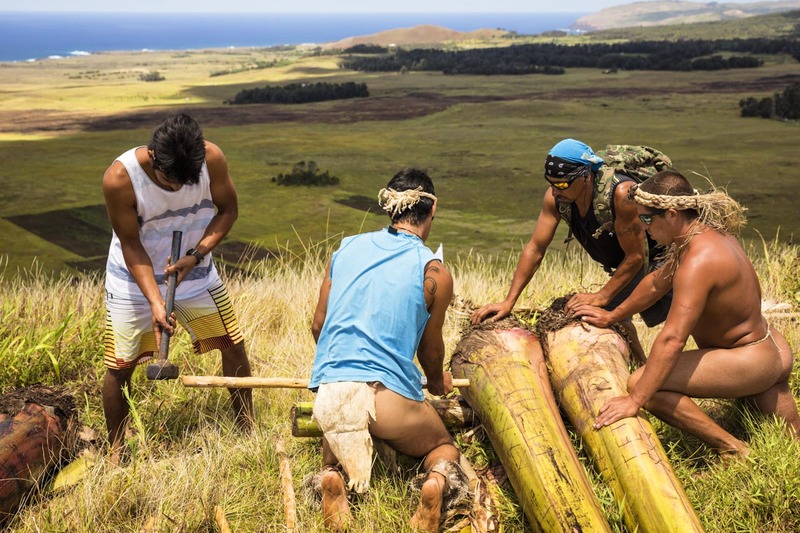 The sport pits the island’s boldest ‘warriors’ against each other in a contest to see who can ride the farthest on the 45-degree slopes of Maunga Pu’i. Shortly after I captured the above image, another rider was sent airborne somersaulting head over heals at nearly 40 miles per hour. His injuries required a trip to the hospital by ambulance and forced the cancellation of the rest of the competition. There would be no more banana sled riders that day. So what did I do to get this shot? Here’s a short mental checklist of the all the things I do for just about every photo shoot. Arrive early and study the scene and the course of the action. Like a pro golfer, a good action photographer needs to know the lay of the land. I arrived early the day of the haka pei to photograph the preparations for the competition. This not only allowed me to capture other spectacular photos of the competitors but to study the run where the riders would be competing. It was apparent that in order to cover the event, I would have to start at the top and work my way to the bottom. It took almost fifteen minutes just to clamber up the steep slope to the top where the riders were assembling their sleds and preparing their wardrobes. From there it was a long way down to the bottom by foot, maybe only 20 seconds by banana sled. I wanted to get some shots of the start of the competition as the competitors were push-started by their companions in arms. I would then walk downhill taking some action shots mid-slope and finish at the bottom in time to capture the last competitors as they slowed to a stop and jumped off the sleds. Select an appropriate lens for the action. The famous 20th century war photographer Robert Capa once said, “if your pictures aren’t good enough, you aren’t close enough.” I took this to heart as I worked to document the haka pei competition and get as physically close as I could to the action. Often a volunteer organizer would warn me that I was too close and had to step back for my own safety. When I couldn’t get as close as I wished I then relied on my zoom lenses. For events like this, I typically carry two camera bodies, each with a zoom lens. One is for wide to normal range images — often a 24-70mm — the other for telephoto use — a 70-200mm. Between these two options I can cover a great deal of ground. For my opening shot I opted to use the 24-70mm in order to capture the breadth of the slope and include the ocean in the background, which would not be possible with the longer telephoto lens. Visualize the shot you want. 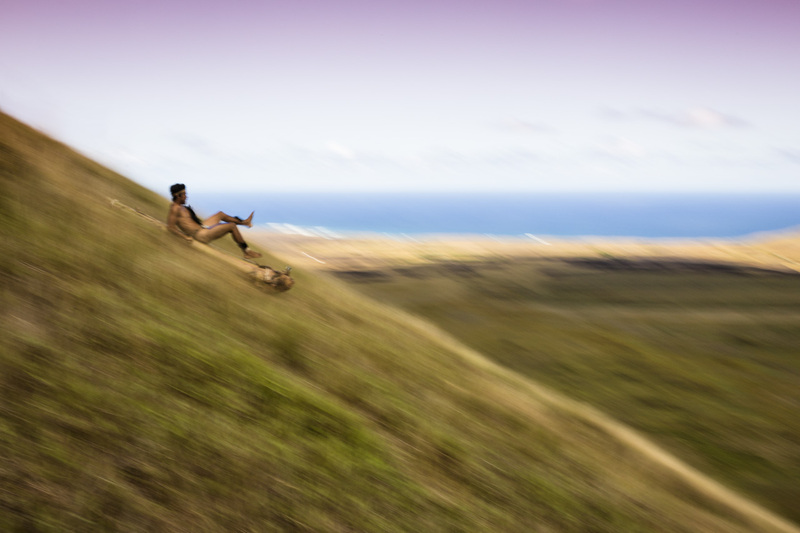 Even before stepping foot on the slope of Maunga Pu’I, I had an image in mind of what I wanted to create. I studied how other photographers had shot the competition in previous years and noticed something similar: They all used a fast shutter to freeze the action and were taken from near the bottom of the slope. The shots were zoomed in tight to show the tension on the faces of the athletes and frozen clumps of grass in the air. While some of these shots were quite dramatic, they failed to capture the spirit of the location that was only possible with a wide angle view. I wanted to attempt something different and thought to use a favorite but hard to execute technique called action panning. This technique is used to show motion for fast moving subjects like cars and cyclists and does so by keeping the subject in sharp focus and the background blurred. Our brains interpret this blurring of the background as motion and an object can appear to be moving much faster than it is in reality. This type of shot would be much more artistic visually and would connote the feeling of speed. Set your camera’s settings and exposure before the action comes into frame. As I would be panning the shot to show motion, I had to set up my camera in advance. To set up this type of shot, I utilize the camera’s shutter priority mode (Tv on Canon, S on Nikon) to manually select what I think is an appropriate slow shutter speed given the effect I wish to create. A slower shutter speed will result in more motion blur but also make it harder to capture sharp images. I set my camera to continuous auto focus, high speed shooting and manually selected a focal point located in the upper left of the viewfinder. This will be where I’d place my banana sled rider in order to show the direction of travel. Anticipate where the action will occur and be ready for it. When panning, it is really important to follow the subject with the camera before it reaches a point perpendicular from your body where you would fire the shutter. I now found myself stationed at the half-way point of the sled run, struggling to maintain my balance on the slippery slope. I could not see the starting point of the run due to the slope and masses of spectators lining the course but could hear a rider approach from the roar of the same people. The run was unlike a groomed ski run. It was covered in tall grass with various ruts and dips in spots and, fortunate for the riders, had no large rocks. Only one rider was allowed to descend at a time and it seemed that no two riders chose the same track down so it was hard to determine from where the riders would appear. On top of that, the riders and their sleds were practically camouflaged in the tall grass so tracking them was extremely challenging. Do a series of test shots and review them, then modify settings as needed. When attempting to pan action like I was doing at this event, I took a few test shots and reviewed them to check exposure and the effect of the motion I wanted to create. Of course, there were no ‘test runs’ so I had to sacrifice the first initial runs to practice my panning motion and timing. Panning the action on a steep slope was more difficult than it would have been on a flat course as I had to follow the action diagonally. I tested a few shutter speeds to get a variety of different looks. Upon review of my shots afterwards, I noticed that the horizon was slightly askew but it was easy to correct this with my image editing software. Panning this type of action with slower shutter speeds means that you’re only going to get a few shots in per run of which maybe half might be sharp if you successfully locked focus onto the subject. I decided to try this technique on only about four competitors as I needed time to work my way down the slope to catch the last sleds at the finish. Unfortunately, the event ended early with an accident to one of the middle competitors who ironically was the most experienced rider. In the world of haka pei, you place your life in the hands of the Rapa Nui gods when you lie down on your sled. In the world of photography, you should hope that you’ve taken enough shots to capture the essence of the moment. 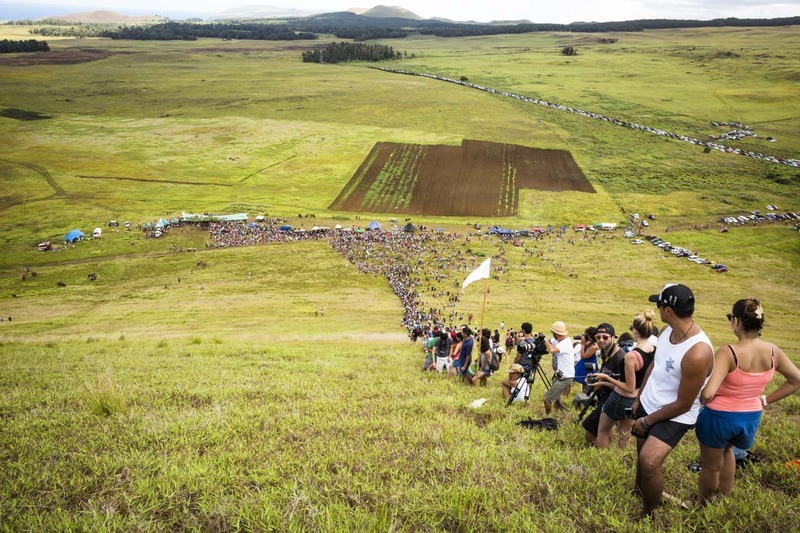 Easter Island is a long way from anywhere and the haka pei only happens once a year.